Any time a game is decided by a late touchdown, you can bet on the score being the play of the game. After taking a 3-0 lead, Nebraska spent the rest of the night playing from behind until one play changed the game — and the outlook for the season. This week’s play of the game is Stanley Morgan Jr.’s touchdown catch with 14 seconds to go. On fourth and 6 with less than four minutes to go, Nebraska failed to convert, handing the ball back to the Boilermakers looking to hold onto a 24-19 lead. 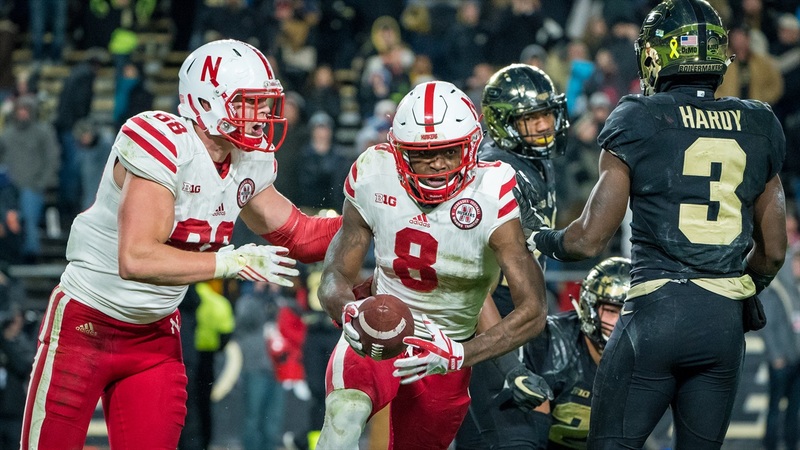 However, the defense bowed up and five plays later Purdue punted back to the Huskers, giving them one last chance. “I think it was a little disappointing not to get it done on the drive before, but when it mattered most our defense got a stop, did their job, got us the ball,” junior quarterback Tanner Lee said. “We knew it would be tough with no timeouts but I think everybody wanted to get it done and I think everybody knew we could. All game we were kind of right there, right there but we couldn’t get in." Nebraska’s drive started on its own 30-yard line with 82 seconds on the clock. Quarterback Tanner Lee picked apart the Purdue defense, working the sidelines for chunks of yardage while his receivers got out of bounds after nearly every catch. Lee’s first and only incomplete pass of the drive came with 14 seconds left on second down, setting up third and 4 from the 13-yard line. Nebraska lined up in 11 personnel with Morgan and JD Spielman stacked to the left of left tackle Nick Gates, tight end Tyler Hoppes to the right of right tackle Brenden Jaimes and flanker De’Mornay Pierson-El split out wide right. Spielman ran a short out near the line to gain while Morgan kept going and ran a post, catching the ball and avoiding an approaching Boilermaker to fall over the line and give the Huskers the lead. As Riley said, the timing had to be perfect as the window was tight, but Morgan found the perfect spot and Lee put the ball on the money. Nebraska failed to convert the ensuing two-point conversion, but the defense got a stop to seal the game. Morgan said he got excited when he heard the play call and wanted to come through for his teammates. Needing one last drive to salvage the season, Nebraska put the ball in the hands of its veteran quarterback and together with his best playmakers, he delivered. That’s why Stanley Morgan Jr.’s 13-yard go-ahead touchdown catch with 14 seconds left is this week’s play of the game.